Scotland are put to the sword in the capital by Kazakhstan and are left playing catch-up in Group I after an opening night horror show at the Astana Arena. Kazakhstan stunned Scotland on opening night of UEFA EURO 2020 qualifying in Group I. Қаршығалар (The Hawks) picked apart the Scots and inflicted a damning 3-0 victory on their visitors on the banks of the Ishim River. Scotland made the trip to this progressive city in optimistic mood after their improved performances in November secured a UEFA Nations League play-off spot but there was nothing progressive in their display on Thursday evening as the Kazakhs strolled to an emphatic victory. It may only be Matchday 1 of this campaign but with this result, Scotland have been delivered a body blow that may just prove to be fatal to their automatic qualification hopes by the time November rolls around. By the time Scotland had arrived in Astana this week, they were in the newly-named city of Nursultan. No, they hadn't boarded the wrong flight, instead, this modern city, prompted by the resignation of it's president, Nursultan Nazarbayev, had taken the decision to re-name itself after his decision to bring an end to his 29-year tenure. So, while there was much change around the city as Scotland arrived, there was more of the same on the pitch as the Scots delivered another typical, turgid display away from home to one of the minnows of European football and were ultimately outplayed on the night by a side ranked seventy-seven places below them in the FIFA World Rankings. The opening minutes of this match in Group I offered little to suggest the capitulation that was about to follow for Scotland. It was a promising opening few minutes for the dark blue, they maintained possession and passed with purpose allowing Celtic's Oliver Burke an early chance to probe out wide only for his cut-back to be cleared by the Kazakhstan defence. That was as promising as it got for Scotland as Kazakhstan displayed a ruthless streak just moments later, drawing first blood via FC Astana striker Yuriy Pertsukh. Pertsukh, earning his third cap in the stadium he calls home, delivered his first-ever international goal with a quite sumptuous finish to leave the home fans in early hysterics. A poor goal to concede as Scott McKenna and David Bates were caught out by the long ball from the half-way line and the striker did the rest. If that was a minor setback, what was to follow just three minutes later was a complete disaster. Kazakhstan would gleefully double their lead and while the roof was firmly closed on the Astana Arena on this night, the home support threatened to blow it off when the second goal hit the net. Another excellent pass from Kazakhstan, this time by Islambek Kuat, exposed real slackness in the Scottish defence and from Graeme Shinnie especially, allowing Yan Vorogovskiy to help himself to his first goal at international level. Scotland still had plenty of time but Kazakhstan had their game plan set and it worked to perfection. They allowed Scotland to have large amounts of possession and whenever they won the ball back, they looked to counter and looked dangerous every time they advanced forward with a frazzled, panicked Scottish defence struggling to contain a side that you would've struggled to believe are ranked so deep in the bowels of the FIFA World Rankings. With any Scotland attack being quickly and easily repelled by the home defence, it was up to the Kazakhs to deliver the next chance of note as they threatened a third goal. Kuat, after delivering the assist for the second goal, fancied one himself and forced Scott Bain into a save in the process as his swirling, dipping effort was pushed away for a corner. The half-time break provided some respite for Scotland and a chance to regroup and perhaps come out reinvigorated and looking to turn the match around. Instead, the home side delivered the knockout blow just six minutes after the restart with Baktiyor Zaynutdinov heading in the third after a delicious cross out left from Gafurzhan Suyumbayev that left McKenna utterly lost under it's trajectory. Alex McLeish had made tactical changes at the break with James Forrest, the hero in November, moved more centrally and Oliver Burke, who had at least given the Kazakhs some problems out wide, also moved further in-field. These decisions along with the subsequent substitutions that brought Manchester United's Scott McTominay, MLS star Johnny Russell and debutant Marc McNulty did little to change the course of this match. Kazakhstan were the only side that looked like scoring and they might've had a fourth through substitute Serikzhan Muzhikov with his close-range header held by Bain with a few minutes left to play. The final whistle was music to the ears of the Scotland players, staff and 650 fans that made this trip. Kazakhstan's players and fans could not contain their delight after achieving, perhaps, one of the best results in their history and for Scotland, embarrassingly, they did it without really having to move into second gear. 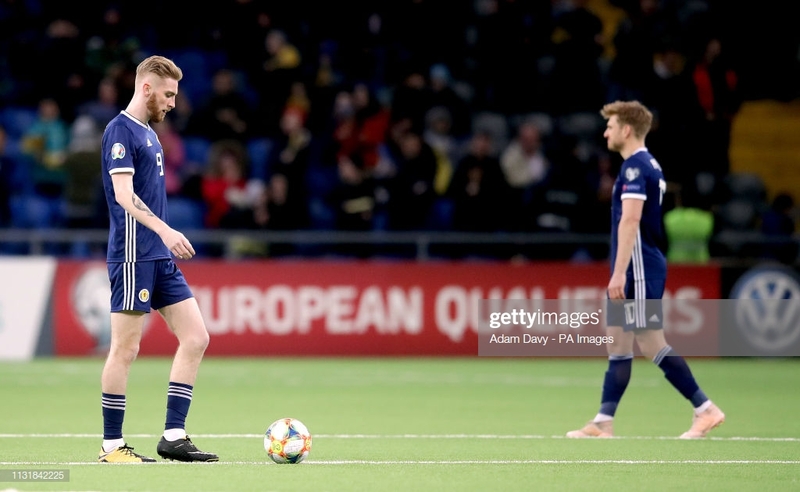 Scotland were quite frankly embarrassed on Thursday evening as they were comprehensively outplayed and outfought by a side that had only won three of their last thirty-eight competitive matches stretching back to 2011 before they stepped onto the synthetic turf at the Astana Arena. To further pile on the misery, Scotland join international minnows Andorra as the only side to have conceded three to Kazakhstan in a competitive qualifier since the Kazakhs played in the Asian qualifying section for the World Cup back in 2004 where they would regularly score goals against teams such as Macau and Nepal. Some would say this is one of the worst results in Scotland's history and it is hard to argue given the scoreline and the lethargic performance on the pitch. Scotland have struggled over the last twenty or so years to produce quality options in defence and it often sticks out like a sore thumb just like it did tonight. Undoubtedly, the Scots were weakened by the news that the two best players in the side, Liverpool's Andy Robertson and Celtic left back Kieran Tierney were unavailable for the match and instead had to place Graeme Shinnie of Aberdeen and Liam Palmer, making his international bow, of Sheffield Wednesday in at full back. The central defensive pairing of McKenna and Bates had performed relatively well in recent games but this was a makeshift defence that panicked and suffered every time that Kazakhstan came forward. All three goals were preventable with McKenna at fault for two and Shinnie potentially culpable for all three. This was not a good night for the backline. The defence creaked and staggered it's way through this game and Kazakhstan, truthfully, could've had more goals. It was a night that once again showcased just how poor Scotland are at the back and just how much they need their two injured stalwarts too. It is fair to say that Alex McLeish has not enjoyed the full support of the Tartan Army since his appointment in February 2018. This is the second go-around at the Scotland job for McLeish after his initial departure in 2007 left a sour taste in the mouth and many believed that, after being out of football management for several years, his outdated ideas and managerial style made him the wrong fit for the job. The initial signs for McLeish were not good with just two wins in his first eight games and the pressure was truly on after a dismal defeat in Haifa left Scotland with much work to be done in a UEFA Nations League campaign that would end in success with victories over Albania and Israel at the end of last year. Those results bought McLeish some time and the swirling discontent disappeared for a while but after tonight's abysmal result, one that the manager told Sky Sports in his post-match interview, "was horrible", it seems certain that the knives will be out for the manager once again. Kazakhstan are not used to memorable nights like this and several of their players produced on the big stage to provide it. Yuriy Pertsukh started the party with an outstanding finish that undoubtedly was the best of the match. Vorogovskiy and Zaynutdinov deserve a mention as they maintained their composure for the second and third goals respectively but Islambek Kuat was the best player on the field for the home side, providing a strong presence in the midfield and also the assist for the second goal. As for Scotland, no player stood out for the right reasons. Oliver Burke had a promising start and was easily the biggest threat with his pace but he faded quickly while Stuart Armstrong was the only player to at least force a save from Dmytro Nepohodov but the entire team really lacked the drive and determination needed to turn the game around. The temperatures dipped in the capital this week, with -7 reported outside on Thursday evening. In comparison, in the closed-roof Astana Arena, it was a much more tropical 11 degrees. Despite this, Scotland froze on the night and were simply blown away. Nursultan is a city that has undergone six name changes since it was established in 1830 but this was the same old Scotland that turned up on Thursday night and that certainly doesn't look like changing any time soon.